For a $10 donation, attendees can have a professional portrait taken of their favorite pet. 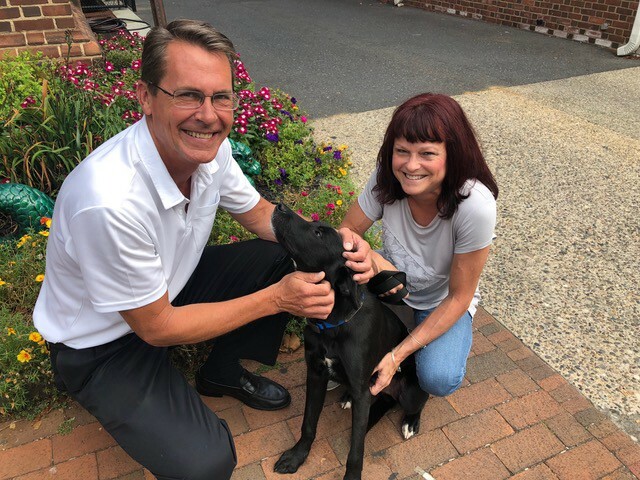 From left: Stan Smoyer of TheSmartMove.com, Glenn, a recently adopted ‘New Best Friend’ and Debbie Hampton, Director of Development for the Burlington County Animal Alliance. Real Estate Agent Jacki Smoyer from The SmartMove.com is hoping to help benefit the Burlington County Animal Alliance with “Pet Photo Sessions” from 11 a.m. to 2 p.m. at the annual Mt. Laurel Fall Festival at Laurel Acres Park on Sept. 22. Those in attendance can stop by TheSmartMove.com booth for a personal “Pet Photo Session” by professional pet photographer David Jackson of DJimages.biz. In addition, Smoyer will match the first $1,000 in donations. “We are so happy to be partnering with Jacki Smoyer of TheSmartMove.com. She is a true pet lover and we are so grateful to her for putting together and sponsoring this alumni event to benefit the Burlington County Animal Alliance,” said Debbie Hampton, Burlington County Animal Alliance Director of Development. The Burlington County Animal Alliance is also inviting all families that have adopted pets from the Burlington County Animal Alliance to stop by and participate in the official “ 2018 Burlington County Animal Alliance Family Alumni Group Picture” that will take place at 1 p.m. at booth No 74. Smoyer, a Mt. Laurel and Marlton sales associate for Weichert Realtors also said she wanted to something that would help protect animals and help them find loving homes. The Burlington County Animal Alliance is a private, nonprofit animal advocacy group. Their focus primarily is on rescue and adoption of shelter dogs and cats from Burlington County and surrounding areas.